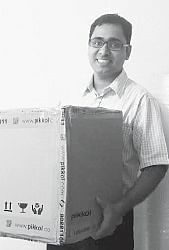 BENGALURU: Shifting can often be backbreaking especially if you are doing it yourself or, worse, have hired an unprofessional movers and packers. The latter could confuse locations, delay without reason or hike rates last minute. While moving to Bengaluru from Chennai, Deepu Chandran’s friend faced similar troubles and so Deepu decided to come up with a solution to introduce transparency and accountability into the system. For eight months, they researched the market of logistics and home servicing. The IIM alumni realised that these issues can be tackled with the use of technology. He co-founded Pikkol in April this year. It is a technology-centric logistics firm, which aggregates reliable movers and packers. They aim to provide trained help and see you through the entire process of relocation - you can create an inventory and receive multiple quotes from different packers. “We wanted to get to the crux of the problem. We train and sensitise our labourers,” says Deepu Chandra, CEO and co-founder. Pikkol assigns packers to customers on the basis of various parameters like availability and location. It provides various materials required to pack different kind of household items to make sure that they are transported without any damage. They also evaluate their packers with the feedback they get from vendors and customers . Within eight months of its inception, they have shifted more than 6,000 house across 100 cities. Around 30 per cent of them have been their intercity customers. People have shifted to Shillong, Kolkata, Delhi, Mumbai, Chennai, Trivandrum etc from Bengaluru, says Deepu. Sometimes, you are in between places and aren’t sure where to keep your furniture meanwhile. Enter Pikkol, with its storage facilities. “A customer was renovating his entire duplex in Cunnigham road. He moved to a smaller house and stored his things at Pikkol for a couple of months,” says Deepu. Pikkol started operations in Bengaluru and now runs operations in Mumbai and Delhi as well. It aims to become a one-stop platform for all the shifting services in all metro and II tier cities in six months and reach out to 25 cities in a year by capturing 80 per cent of the demand.